WILLEMSTAD - In a masterful stroke the Chinese succeeded in outsmarting the Curaçao Government for the second time in a row during their ongoing mutual negotiations to achieve a scenario which presumably has to be advantageous for both parties. 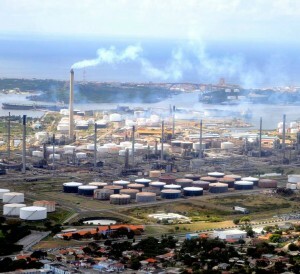 In this contract, as said before, GZE committed itself with elaborate guarantees published in the local newspapers and by radio and TV to modernize the Isla refinery for an assessed cost of, in the meantime reduced to 6½ BILLION USD but again many citizens of Curaçao had (and expressed) their doubts, since included in the assessed amount for the upgrading was approximately one BILLION USD for the clean up alone of the environmental pollution, caused by Isla during its 105 years of existence. People warned the government in letters to the editor and on radio talks shows, that GZE was not likely to spend billions for cleaning up pollution which was not caused by them, but to no avail, the coalition clung to the chosen strategic partner, which caused such discontent and strive within the community that last year’s coalition government was toppled by the opposition and had to make way for new elections after much upheaval. The new elections were held on April 28th of this year and the slogan which was repeated over and over again was the modernization of the Isla refinery by -incredible but true- the same strategic partner. And the negotiations continued and have been ongoing in the meantime for 11 months, but not a single job has been created, let alone any investment made in the modernization of the Isla. On the contrary: during the past 11 months GZE has only been insisting on an Addendum to the signed contract to the effect that it would be allowed to build a whole new refinery at Bullenbay instead of modernizing the old Isla. And lo and behold the government consented to this and signed the Addendum this past week and thus GZE is “off the hook” and is relieved from all the commitments made by it last year, but at the same time GZE forcefully clings to its unmitigated efforts to get full control of the oil terminal (which was part of the deal for modernization). Utterly remarkable is also its new promise of a feasibility study to build(? ), no to “investigate the possibilities” to build a new refinery at Bullenbay, at the same time when the President of China announced through the news media worldwide that China is going to quit its involvement with the petrochemical industry and is going to focus on developing its auto industry in view of the unstoppable advance of the electric car. Many people are baffled and ask themselves what powerful “incentives” the Chinese must have provided to the advisors and decision-makers on key-positions within the government, to motivate them to reach their decision to sign this Addendum, by which everything is put on hold to accommodate the Chinese to opt for the future scenario which is most advantageous to them. Employment opportunity??? How so? When? Investment of BILLIONS of dollars??? How so, when? Many people also ask themselves whether Donald Trump will be “not amused” or will simply acquiesce in the establishment of a Chinese maritime and commercial stronghold in the backyard of the U.S.A. by its full control or maybe even its future ownership of the deep seaport of Bullenbay strategically located on the maritime highway from both the U.S.A. and Europe to the Panama Canal. (to be continued by an elaboration on the management and control, or even the ownership of the deep seaport at Bullenbay).